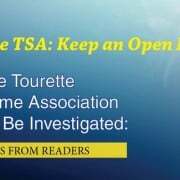 The TSA has censored and controlled the media message, making it difficult for families and physicians to learn of integrative and natural approaches to Tourette syndrome. Producers of two documentaries on Tourette syndrome and a doctor writing for a pediatric journal contacted us. Each wanted to include information on natural approaches in their work. 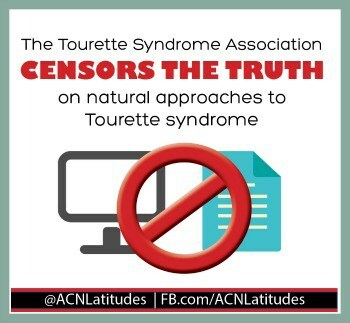 And in each case, the Tourette Syndrome Association made sure that did not happen. I was contacted by the BBC about a documentary on Tourette syndrome being produced for the Discovery Channel. A production team flew from London to West Palm Beach, Florida to film our efforts in my home. The BBC team was wonderful and was genuinely interested in alternative approaches to Tourette’s. After filming me, they went across the state to get the story of Ginger and Griffin Wakem. We’d been told it would take months for the film to be finalized. As we waited, e-mail messages started coming from key BBC staff. Sorry, Sheila. We’ve heard we have to cut some of the material; So sorry, we’ve been told we shouldn’t include most sections of the film on natural approaches . . . . I was informed this directive came from someone on the Tourette Syndrome Association’s medical board. In the released 2000 documentary Tourette’s Syndrome, all the filming done on our efforts was cut. A brief segment showed Griffin and Ginger but gave no details on actual therapies used or how anyone could find help. We responded that we could definitely find people who would be happy to share their success stories. We soon received a “thanks but no thanks” message. 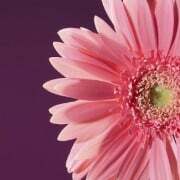 The producer had been instructed that they could not feature anyone who used natural approaches to control tics. You see, I Have Tourette’s, But Tourette’s Doesn’t Have Me was produced in association with the TSA. The film’s producer was interested in including children who had symptom control without drug therapy and knew the public was interested as well. But the TSA wanted to withhold information from the public it had been aware of for many years. It is unfortunate for families that the TSA would not allow this otherwise excellent documentary to include at least one child who has control over his or her tics thanks to integrative therapies without drugs. 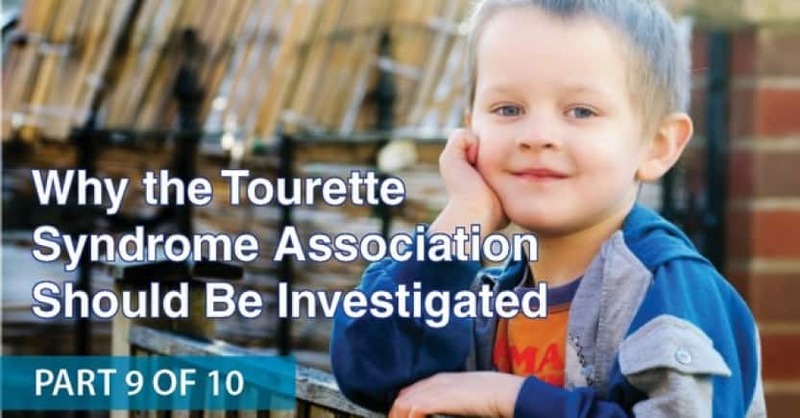 I received a call from a doctor who explained he was doing an article on Tourette syndrome for a pediatric journal and was interested in learning about natural approaches to Tourette’s. We talked a bit, and at the end of the call, he told me he was a new member of the national Tourette Syndrome Association’s medical advisory board. My heart sank, because I knew what would come next. Sure enough, it was not long before he had the courtesy to let me know he’d been told by the chairman of the TSA medical board not to include approaches related to diet and environmental triggers like allergy in the article. This doctor’s 2005 article ended up in the journal Contemporary Pediatrics and is featured on the TSA’s website. It was discussed in Part Seven of this series, because instead of the article simply omitting information on diet and allergy, it was worse. 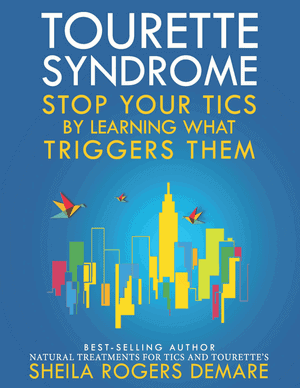 It falsely claimed it was a “myth” that dietary and allergy efforts for Tourette syndrome can minimize tics! We are under no illusion: ACN Latitudes is David, and the TSA is Goliath. But that doesn’t mean the truth will not prevail and that the voices of families everywhere will not be heard. Wow. This is unbelievable. I had no idea you have put up with this over the years. This is criminal and unbelievable for an organisation whose objective it is to help TS sufferers. I do not understand what they fear in allowing people to read about non-invasive, non-harmful approaches that have been successful for many people. For the sake of all the people who could be helped, they need to acknowledge mistakes of the past and start working with you and others to share your experiences and other families to order to save lives. I do hope the current TSA members can be brave enough to change their course. Good luck and well done. Thank you for your dedicated work. Hi Penelope, it’s been pretty tough to take (especially the BBC one!). And those aren’t all the ways our voice is muffled. Somehow I always expect the best from people and it’s been an eye-opener. Thank goodness for the internet, and our amazing webmaster, who volunteers for us. Afraid such things are not confined to the world of TS – they seem to happen in autism etc too. Too many vested interests and closed minds. . . Have you thought about releasing your own program via YouTube or anything? What a shame. 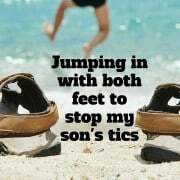 My sons tics were not bad until we moved to Florida and even then they were not considered to be bad enough to deal with the side effects from the medication. However, I noticed that it was the worst in the spring and when we left the state they were almost non existent. After lots of research I read about magnesium deficiencies and we changed his diet. Magnesium and allergy meds took away the awful head jerk tic that he had. An easy solution, heartbreaking that this association will not recognize these treatment options. Angie, I’m so happy to read that your efforts to help your son paid off. And your observations about allergies in the spring and leaving Florida helping (maybe because of the humidity and mold–or specific allergens there?) were valuable. Magnesium can be a big issue. It takes a parent like you who is willing to research on her own and put the pieces of the puzzle together. Your son is lucky to have you as his mom! The question to ask is does the TSA receive any funding from the pharmaceutical industry? – I recently assisted a friend with MS to raise money to have stem fell treatment in Russia, her treatment use to be available in Canberra but the MS Society shut it down on the basis that it was experimental. Sixty Minutes got on board and Kristy’s story, recently aired, has helped many around the world and at least 60 MS sufferers now on their way to seek treatment. Research confirmed that the MS Society received substantial contributions for “research” from the drug companies – it was simply not in their interests to have people being treated into remission when every MS patient is worth between $25,000 – $40,000 per annum to the pharmaceutical industry. Carol, yes the TSA gets some funding but I don’t know how much. Their budget is well over 7 million a year. I would love to know more about your successful effort regarding MS. Congratulations on helping to achieve such an important goal! Fantastic. It shows there is hope to make things happen! It is shocking that the TSA wasn’t willing to make the public aware of alternative treatments that could potentially be helpful at mitigating tics. What is the risk in telling people that there have been reported cases of people who have gotten better by making some simple adjustments to their diet and their environment? There is absolutely no harm in providing this type of information, which can potentially benefit so many people. Avoiding allergens, artificial colors/flavors, molds, perfumes, pesticides, and other harsh chemicals is a “no-brainer” that everyone should be doing… regardless if you have tics. These adjustments are not controversial or risky for people to try. Why is the TSA so eager to put kids on drugs with harsh side effects when there are much safer alternatives to first consider? I am sure it has been a very frustrating journey for you and your non-profit organization, but I applaud you for doing this series against the TSA. I truly hope that this series of postings opens up their minds to sharing natural treatment options. Chris, you are so right that the environmental interventions you mention would be helpful for everyone. A no-brainer, as you say. Yes it’s been very frustrating at times, but the overall effort has been rewarding and we aren’t giving up. The longer this has gone on, the less I expect the TSA to change their ways. But there are other means for us to bring about change. With people like you, we can do it. Thank you for the support and I hope you will stay in touch. Thank you for your courage and your voice. I agree you can substitute the word Autism, Alzheimer, or Cancer. Autism went from 1 in 10,000 to 1in 58. It is scientifically impossible to have an explosion of a genetic disorder but Drs continue to tell parents it must be somewhere in their family history and sadly most believe. Our Autism Dr. like on this forum finds severe allergies, infections, gut issues and triggers. He wonders probably just like you, “Who is drinking the Koolaid?”. I like that, 3bmom–who’s drinking the Kool Aid. A retired psychiatrist wrote today that he is now checking into alternatives for himself, and when he looks back he can’t believe the “blinders” he had when practicing conventional psychiatry. Seems it never occurs to most of them to question what they are doing or saying.